a. "This android device's wi-fi settings"
b. "That the devices you want to control are switched on and connected to the same router as this device"
c. "That 'multicast', uPnP & mDNS is enabled on your router"
b. 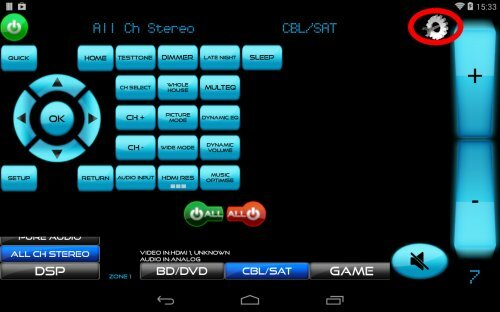 How do I switch back to controlling my AV-Receiver? c. How can I change the input my devices are on? d. How can I rename/reorder/delete my inputs? a. When should I add a device? 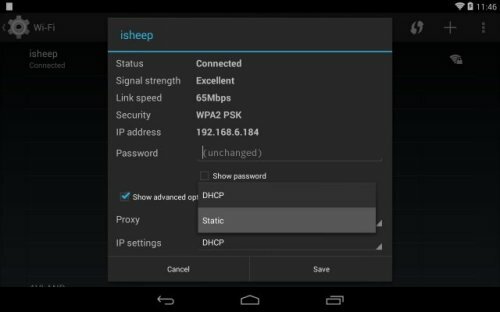 c. Where can I find the IP address of my network controllable device? b. I don't like some of my channels, what can I do? 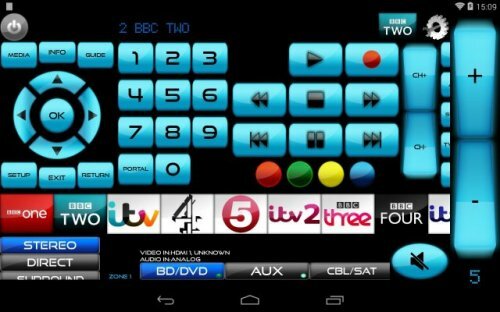 e. I do live in the UK, but can't see any channels! 10. My AV-Receiver has different zones, can MyAV control these zones too? 11. What are those buttons with white squares on them? 12. Where have all the buttons gone? 13. I want to control my devices using IR/Infrared, how can I do this? This is the Settings button. Clicking on this settings button will open a different menu to the one above. This one will open relevant options for the set-top box we are controlling. MyAV has been optimised for use on a tablet in landscape mode, though it will of course run on a smaller device in portrait. When you move your Android device from landscape to portrait, MyAV will resize itself accordingly. If you want to lock the app in position you can do so by picking your preferred layout in the settings menu. Please note that not all of MyAV’s functions will run in portrait mode, and these will force a landscape view on the user. For example, the DLNA browser will only run in landscape. However, if you have chosen portrait to be your default view, exiting DLNA or any function like it will resume operations in portrait mode. 3. MyAV can’t find my AV-Receiver/TV/Blu-ray/etc. If you are seeing the screen above, it means MyAV is having trouble finding your devices. There are a number of reasons why this might happen. We will go through them one by one, but first, please check that your devices listed on our compatibility page. MyAV only supports the products listed on this page, so if your device isn’t listed here then MyAV does not support your device. But fear not! We are always updating our compatibility list, so please check back. If you think MyAV has made a mistake in not supporting your brand-new product, please contact us and we will look into it. Please make sure that the device is connected to the same network the devices you want to control. 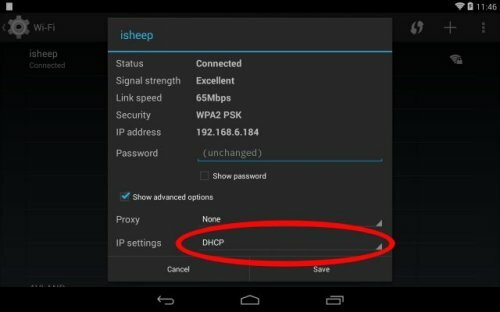 MyAV cannot control devices that are on a different network. In this instance, we are connected to the network “isheep”. Please check that you can access the internet. If you can, then please move on to step 2. 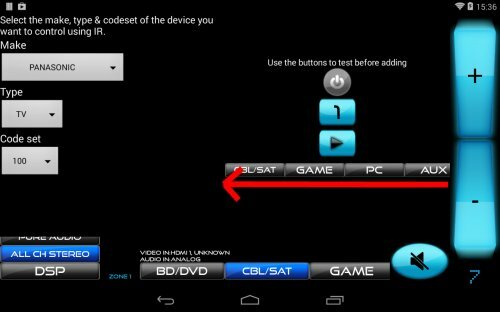 For this you will need to go into the menu of your AV-Receiver/TV/Blu-ray etc and check that it is connected to the same network as your device. In this example, the thing we want to control must be connected to the “isheep” network. 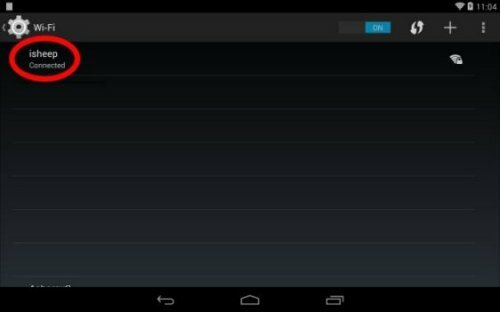 How to do this will vary from device to device, but the starting point will invariably be going into the device’s settings menu and having a poke around there. If you cannot find where you need to go, please consult the user manual for that device. 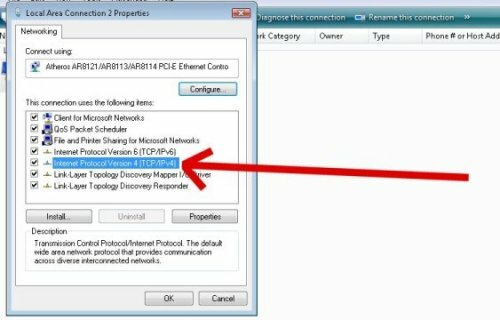 A quick and easy way to check whether these are enabled is to look in your Network on your PC. 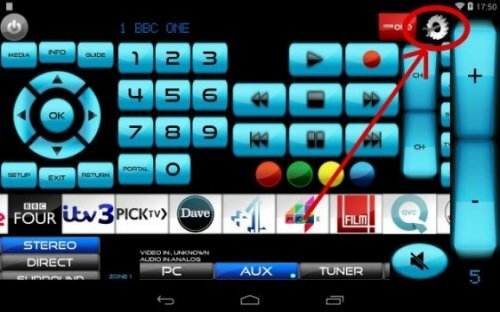 If you can see your AV-Receiver/TV/Blu-ray/etc then everything should be OK. Alternately, if your AV-Receiver/TV/Blu-ray/etc has an official app and this works on your tablet, everything should be OK. Please skip ahead. If you cant see your AV-Receiver/TV/Blu-ray/etc in your Network, or the official app doesn’t work, then please continue to read. For this you will need to know the IP address of your router, its username and its password. If you do not know these, on most modern routers the information is printed on the back of the router itself. 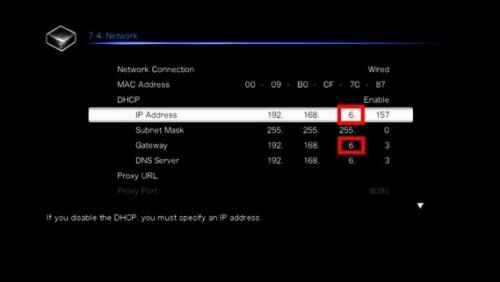 If you have an older router, a quick internet search for “default IP address, username and password” for the make and model should bring back everything you need. Alternately, you can find out the address using your Android device or computer (we will show you how to find it in Windows). A menu will pop up. Select Modify Network. Look for the Gateway address. This is the address of your router. Make a note of it. Go into your Control Panel. 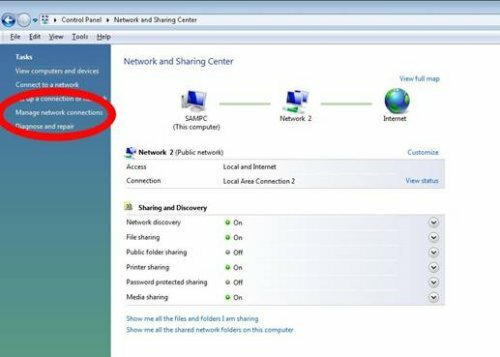 Find the Network and Sharing Centre and open it. 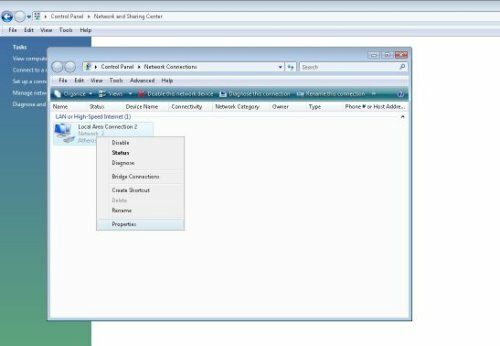 To the left hand side you should find the Manage network connections option. Open it. Find your network, right click on it and select Properties. Find Internet Protocol Version 4 (TCP/IPv4) and double click on it to enter it. Find the Default gateway. This is the address of your router. Make a note of it. All routers are different, meaning we can’t give you a step-by-step guide for each and every one. 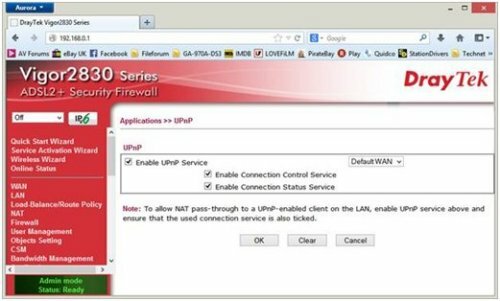 A quick internet search looking to enable ‘multicast’, uPnP and mDNA on your particular router should be of some help though. We would recommend exploring the menus, but be very careful about what you change. Do not change anything unless you know exactly what it is you are changing. You could lose access to the internet if you aren’t sure what you are doing. 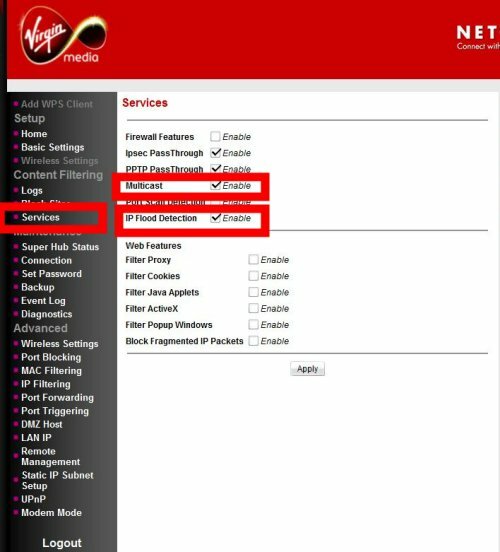 the option to Enable Multicast. 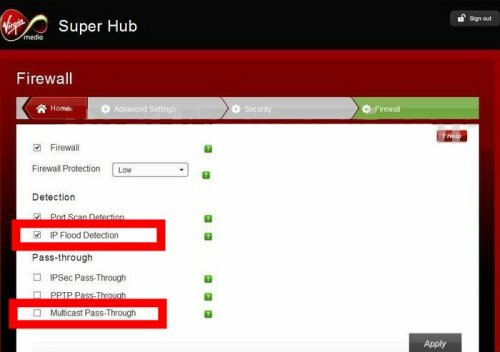 Turning IP Flood Protection Off, and Enabling Multicast allows MyAV to find and control the devices on your network. All devices are different, so, again, we cannot give a step-by-step guide on each and every one. As ever, the place to start is the settings menu of your AV-Receiver/TV/Blu-ray/etc. We will use the example of an Onkyo TX-NR626. Again, if you can’t find how to do it for your particular device an internet search for “set static IP address for [make and model]” should bring back some helpful information. 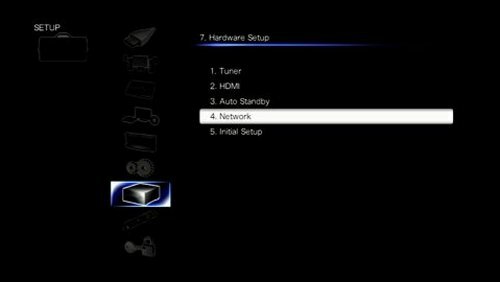 For an Onkyo TX-NR626, you want to go into the Setup menu, go into the Hardware setup, and select Network. 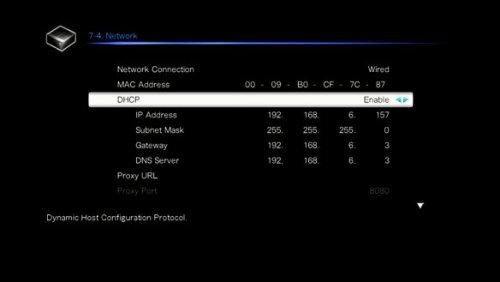 Make a note of the addresses below, and then disable DHCP. This means that your router will no longer give your AV-Receiver an IP address, instead, you are going to specify one. Now you can set a new, static, IP address. The address you enter must follow the pattern that your old one previously had. already being used. Try to use an address which is “far away” from the old one. 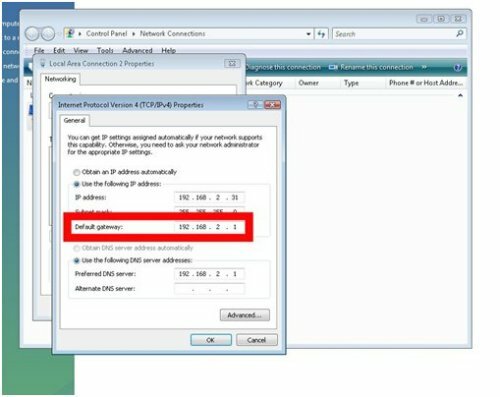 The number must be higher than 1 and lower than 254, and cant be the number being used by the Gateway/router. In this instance, we will change the address to 192.168.6.59. This is our new address. 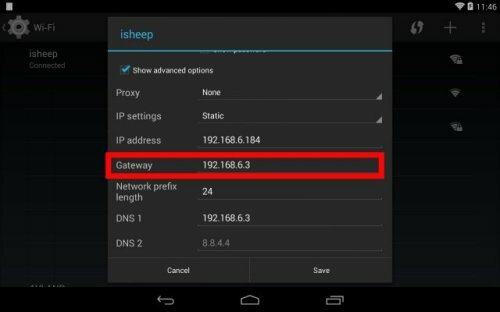 The Gateway and DNS Server address must be the same address of your router. You now have a static address on your network controllable device. You can now enter the address by clicking on "Manually add IP address of device". Enter the IP address in the relevant boxes. The database is searched using the model name or number of the product, not the brand. In the instance below I am trying to add my Humax box. Typing in “HUMAX”, or anything close to it, will not bring back any results. 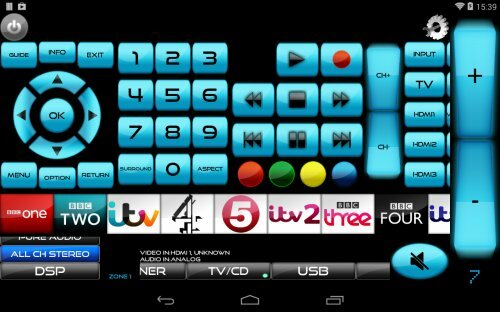 To add, for example, a Humax HDFOXT2 you need to enter the model code – in this case the beginning letter “HDF” is enough to bring back what we want. Click on the product to add it. Hopefully one of these steps will have done the job. However, if having done all this MyAV still can’t find your device please drop us an email and we will do our very best to help. 4. 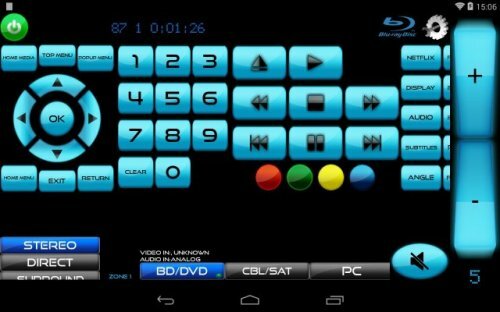 My AV-Reciever/TV/Blu-ray/etc has an android app that controls it but MyAV doesn’t. What gives? MyAV is constantly looking to expand our compatibility, and aims to control as much as possible. If you have a piece of network-controllable equipment and would like to suggest its inclusion in MyAV, please drop us an email. 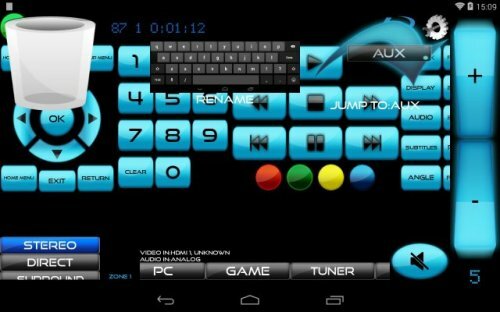 MyAV allows you to control more than one device at once. The volume, input scroll wheel and power remain static, while the rest changes depending on what you want to do. When you first start the app, the devices are added and some may connect quicker than others. This means, for example, you may see controls for you Blu-ray player flash up for a second, then replaced by controls for your AV-Receiver. In order to change between devices, you need to use the horizontal scroller at the bottom of the screen. If you drag this from right to left, it will reveal all the inputs. 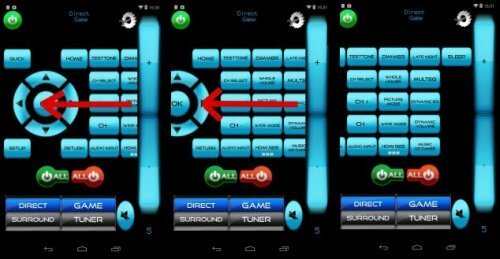 If you have an AV-Reciever, the input will mirror the inputs names of that. If you don’t, the inputs will be named according to what is connected. Inputs that have something connected to them will have a small light on the bottom right of the button. Clicking on the input should switch the device over. If you are using an AV-Receiver, you can go back to controlling this at any time by pushing the Android back button (located at the bottom along with the Home and Window keys). You can change the input something is assigned to by going in the settings menu whilst on the input you want to change and using the Reassign To function. This should then remember your choice in the future. If you hold down on the input button you will have three options. You can drag the input to the rubbish bin to delete that input, drag it to the rename keyboard to choose a new name, or move it along the input scroll wheel to select a new position. e.g. in the picture above, I might choose to rename “GAME” as “Xbox One”. If I let go of the GAME input where it is, it will be moved to being between the AUX and TUNER inputs. e. Oops! I just deleted an input by accident – what can I do? And finally click on “Clear Data”. This will completely reset MyAV – all your settings will go back to default. This function is of use if you have an AV-Receiver. Jump To allows you to change what you control, without actually switching input. Above is a Humax set-top box. Below is a Blu-ray player. Both are going through MyAV receiver. Imagine in this scenario, I have been watching TV but now decide I am going to watch a Blu-ray. When I switch to the BD/DVD input, the AV-Receiver switches input and the film starts playing. 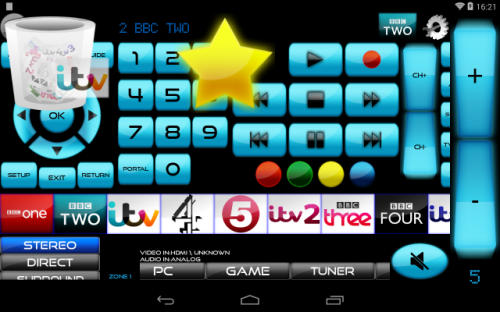 Jump To will let me control the Humax box without changing the input. This means I can continue to watch the film, and record the rest of the program I was watching without interrupting. To do this, you need to click and hold the input of the device you want to control. In this example I want to control my Humax which is on the Aux input. 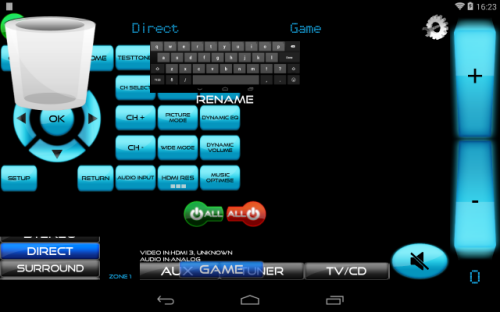 I am then given the option to remove the input, rename the input, or Jump To: Aux. Drag the Aux input to the Jump To icon and let go. MyAV will now jump to the controls for your selected device without changing input. Notice that down the bottom, on the input selector, MyAV still shows the selected input as the Blu-ray player on BD/DVD, but shows the controls for the Humax on Aux. MyAV is constantly changing, and functionality is constantly being added. Also, due to some technical limitations of the things being controlled it isn’t always possible to control every aspect of operation. Please refer to the compatibility page for details on MyAV’s operation of certain products. 99% of the time, MyAV should recognise your devices without you having to enter an IP address. At the moment there is only one exception to this rule – the Humax HDFOXT2. 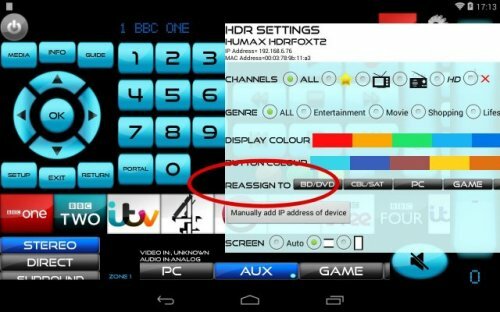 If you have the Humax HDFOXT2 you will need to add it manually. 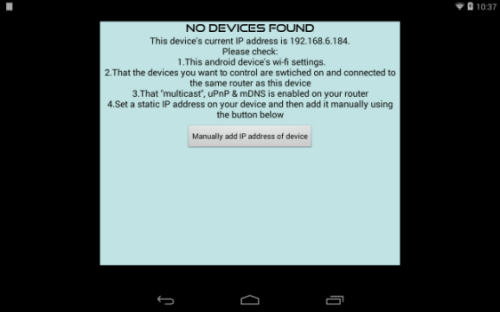 To do this, you simply go into the settings menu and click Manually add IP address of device. Please note that unless the device you are adding has a static IP address, there is the possibility that the IP address will change. When you start MyAV next time, it will then not find your device. To give your device a static IP, please refer to (3d). Unless explicitly stated as something which needs to be done on the compatibility page, please do not attempt to add a device which should be detected automatically as this may cause problems. If your device is not recognised by MyAV on start-up, please refer to (3a, 3b and 3c) before doing this. Please search for your network controllable piece of equipment by searching for the model, not the make. Instead of searching for "YAMAHA", please search for "RXA3030". 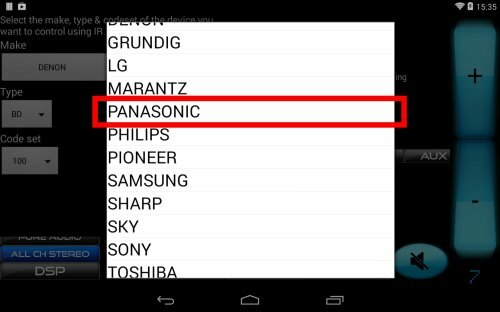 For Oppo blu-ray players, please enter "OPPO"
For Panasonic Televisions, please start the model number with VIERA. 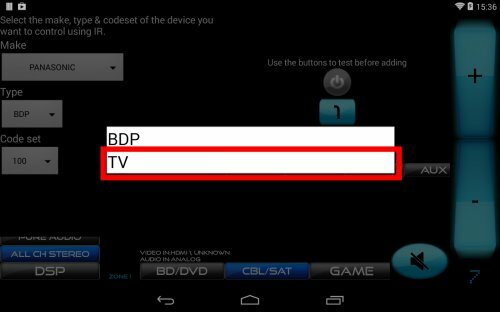 For example, if you have a GT50 please enter "VIERAGT50"
For compatible Sony blu-ray players, please enter "BDP2013"
c. Where can I find the IP address of my device? 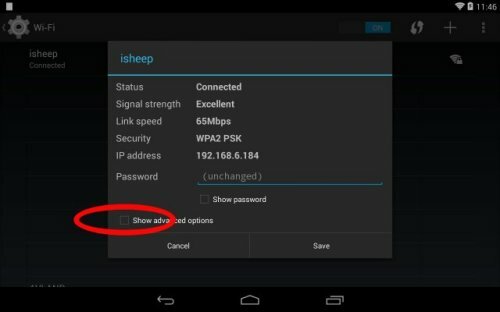 More often than not, the IP address of your device can be found by exploring its settings menu, specifically the network settings. If you are unable to find it please refer to the instructions manual for your device(s). a. Where are my channels? 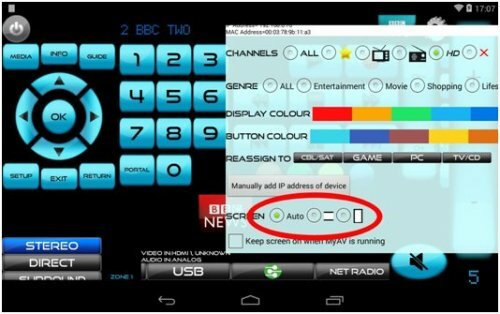 Not all countries are supported for channels, to check whilst on the controls for a device that has channels like a TV/SAT/CABLE box please go to advanced settings, device settings and check if your country has been correctly selected. b. I don’t like some of my channels, what can I do? If you don’t like [insert the name of a channel you don’t like here] then you can put it in the bin. 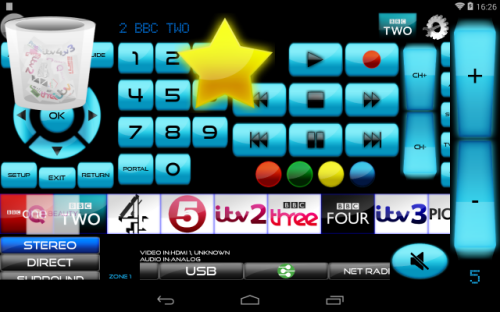 If you want to rearrange your channels so your favourite ones are at the front, go ahead! 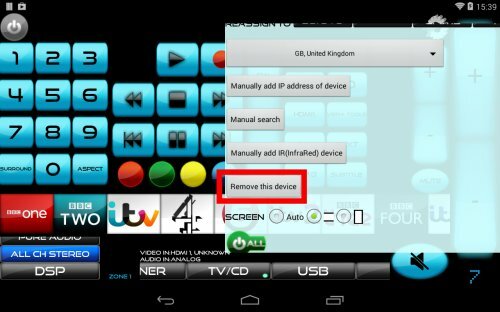 Simply long click the channel you don’t like and move it over to the bin. Once you let go it will be gone forever. To reset this please change the country selection to a different country and then back to your country. 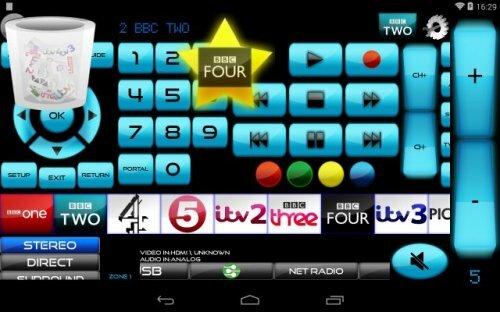 In a similar fashion you can move you favourite channel to somewhere you would prefer. To do this hold down on the icon and drag it where you want to go. 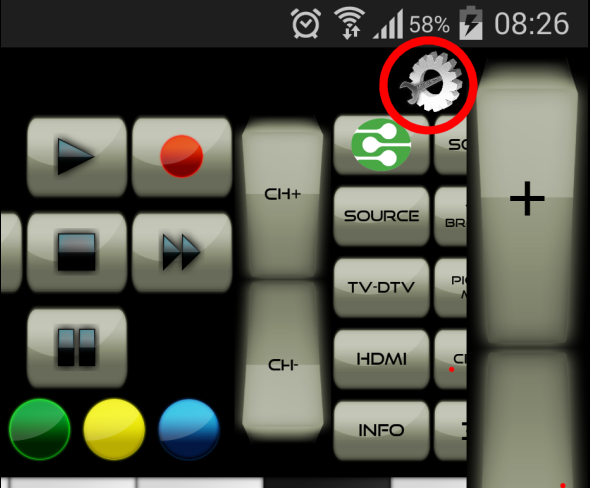 If you want to move the channel further left or further right than any of the channels on screen, hold the icon to the far left or right side of the channel scroller and it will move in that direction. c. Oops! I just deleted my favourite channel by accident. How can I undo this? Unfortunately there is no way currently to undo a channel delete, but you can bring it back by resetting MyAV. Please refer to (5e) on how to do this. Dragging a channel icon into the star makes it a Favourite. You can do this to as many channels as you like. 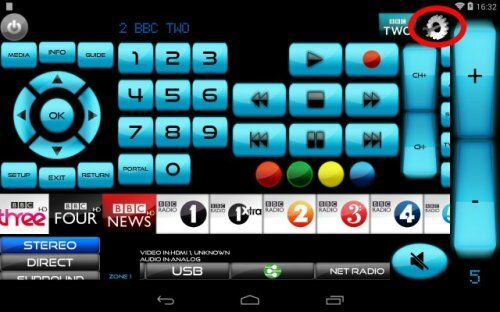 This will then bring up a range of different settings options, but it is the Channels and Genre selectors which interest us. 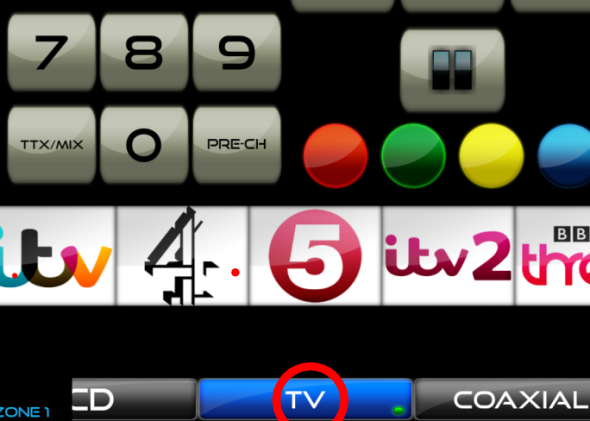 Selecting a channel type will filter the channels into Favourites, TV, Radio and HD. The ‘X’ on the far right will filter out all channels. Will then only bring back those channel that have been added to Favourites. You can use one channel filter and one genre filter to find exactly what you are after, quickly. There are more genres hidden away, all you need to do is swipe from right to left. You can use a channel filter and a genre filter at the same time, helping find what you want quickly. For example, using the HD and are News filters brings back BBC News HD. The layout is contextual, based on what equipment you are using. This means that everyone’s MyAV will look slightly different. 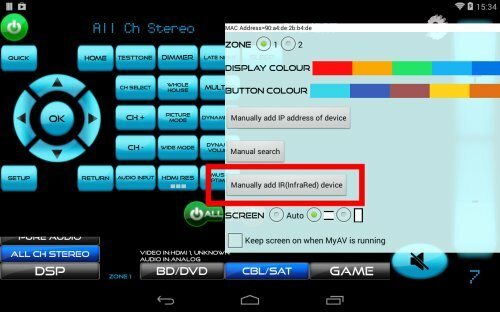 MyAV has been optimised for use with an AV-Receiver, and our pictures are taken using MyAV with an AV-Receiver. There may be gaps of space around the edge of MyAV if you are not using certain items. For example, if you are only using MyAV with a Virgin TiVo box then there will be a gap around the bottom and right hand side edge. 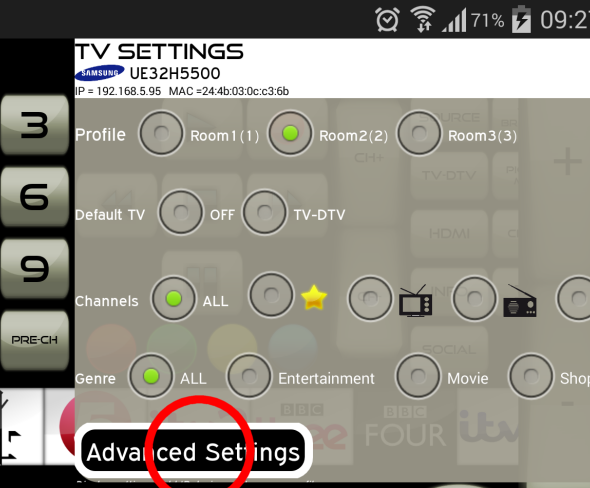 This gap is space reserved for other features so if you use MyAV with a Virgin TiVo and a compatible Samsung TV, the right hand side will be used for the Television volume. MyAV can control all your zones and change their inputs or volume. All you need to do is go to the receiver homepage (if you are on a device and don’t know how to go back to the AV controls, please see 5b) and look in its settings menu (please see 1). Once you select the zone you want, MyAV will now control it. Changing settings in different zones will leave the others unaffected, and you can quickly check which zone you are in by looking towards the bottom left. Please note that zone functionality if often limited and as such not all function will be available. Above you can see that the sound mode wheel has disappeared from the bottom left. 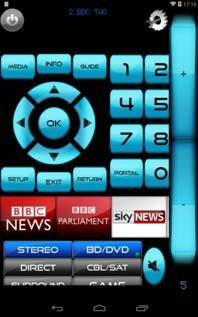 These buttons can be pressed to toggle through the various functions. A button for HDMI resolution, for example, might toggle through 480p, 720p, 1080i, etc. Repeatedly pressing the button will have this effect – just like on the bundled remote. However, you can long click or hold down on these buttons to view their options as a menu. You can then click on the option you want. Once you have selected it, click outside the menu to make it disappear. 12. Where have all my buttons gone? If you have an AV-Receiver with lots of options, or if you use MyAV in portrait mode (as pictured below) you may realise that MyAV does not show all the buttons. When there are too many buttons to be shown at once, they disappear off the screen. The picture below shows three pictures of MyAV in portrait mode. To reveal the hidden buttons, scroll the section from right to left. The principle is the same as that of changing which device you control. If you are lucky enough to own a device with a built in IR transmitter, MyAV can use this to control some non-IP controllable devices. 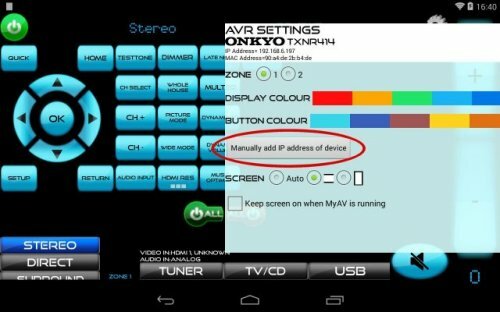 MyAV also supports some IP to IR modules - please check the compatibility page. MyAV recognises whether your device has an IR transmitter, or whether an IP to IR module is on the network. Enter the Settings menu. At this point you should see an option to Manually add IR(InfraRed) device. If this is not visible, please check that the IR module is connected to the same network as MyAV. 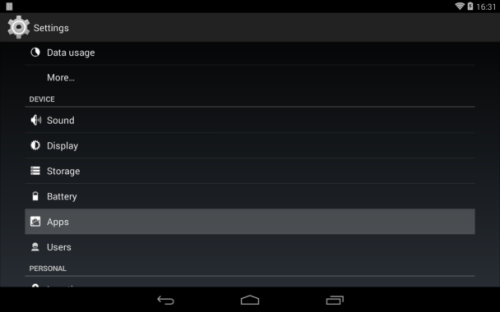 If you are using a device with an embedded IR, but cannot see this option in the Settings menu, please contact us. You can now choose the manufacturer of your IR controllable device. Clicking on this will present you with a drop down menu. In this example, we want to add a Panasonic TV. There are two options to select next. Type allows you to select what kind of device you have. 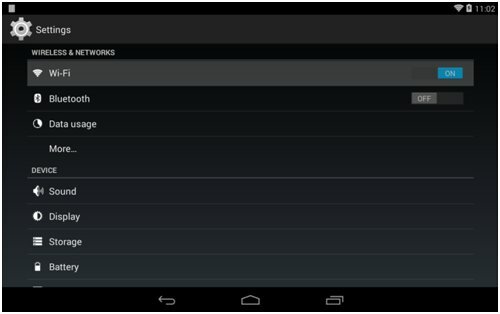 Code set allows you to select codes which work for your particular device. To the right hand side there should be some test buttons. Here we can seen a power button, a number 1 button, and a play button. If some, or none, of these buttons control the desired device, please change the Code set. Ordinarily, the one it defaults to should be OK, but feel free to experiment. Generally speaking, the higher the number the newer the device. When you select Type, you can pick what is it you want to control. We want to control a Panasonic TV . Once you have tested the buttons and have found the right set for you, you can select which input you want it assigning to. This can be scrolled to reveal more input options. Presto, your IR device will now be shown as connected to the desired input. 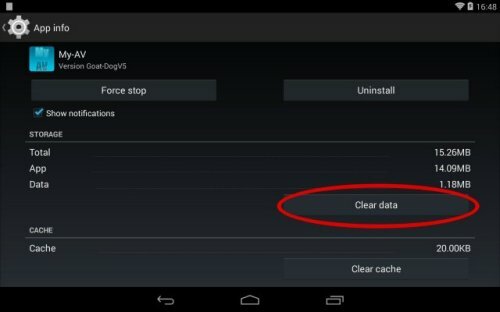 If you want to remove a device, you can do so by entering the Settings menu of that device and selecting Remove this device. Room profiles allow you to have multiple different setups in different rooms of your house. These can also be automatically switched if you have Bluetooth beacons in each room. 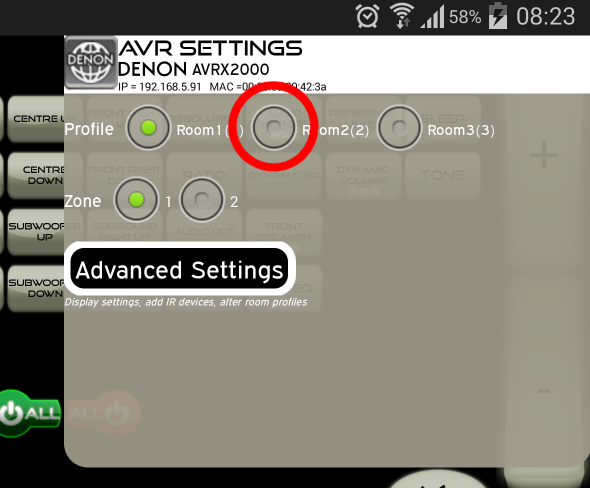 When MyAV is first installed it automatically starts on room profile 1 and any equipment found automatically will appear in this profile. 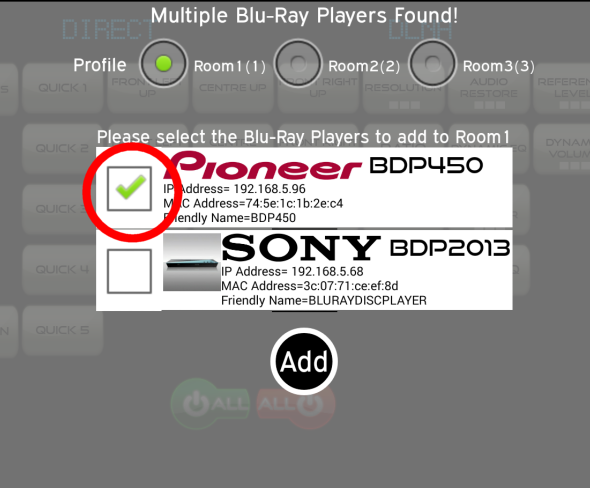 If you have multiple types of the same equipment (2 blu-ray players) it will ask which ones you want in that profile. With AV receivers and TVs, only 1 of each of these is permitted per room profile. 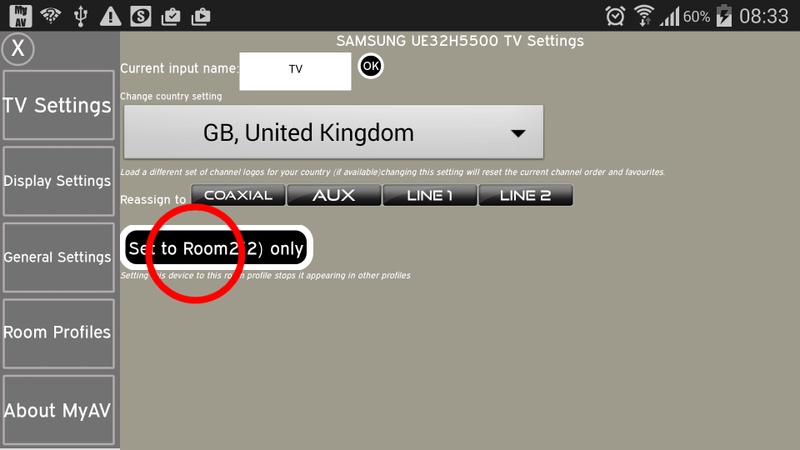 What happens if MyAV is adding a TV to Room 1 and it's actually in Room 2 and there's no compatible TV in Room 1? When only 1 device is discovered of a particular type like a TV then it will "float" across room profiles until it is set or binded to that room profile. To set the device to a particular profile please follow these steps. 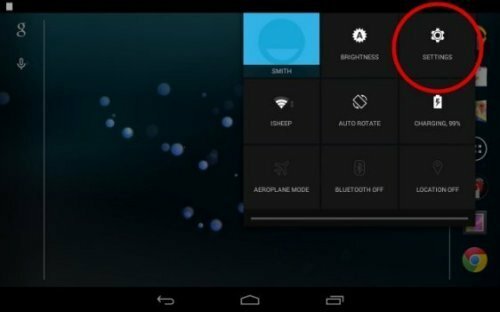 Press the settings button in MyAV. Switch to profile you want the device to be set to. 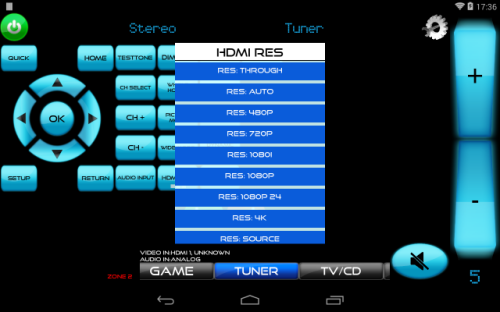 Select the input that the device is assigned to (if using an AV receiver) or just select the device. On the controls for that device press the settings button in MyAV. You should see the model number and make at the top, if so select Advanced Settings. The device make and model should appear at the top of the screen. Press the "Set to Room" button. The device is now set or binded to room profile 2. If you now exit the settings menu and change to a different room profile it should not appear. You can remove it from the room profile by following these steps again, but the button will have changed to "remove from Room ". This makes the device "float" between room profiles again allowing it to be set to a different profiles. You may want to leave the device "floating" if its output is shared between room profiles (for example a satellite receiver with its HDMI output split to a bedroom and a living room).